The southern approach starts in Arsiero (308m) (or just above (361m) if coming from Passo Xomo (1059m)) and goes via Tonezza (and Sella (1110m)) and Bocchetta degli Alpini (tunnel) (1566m) to the top. For a more consistently steep climb you could take the small road from Barcarola (303m). Then above Tonezza you take the small road via Passo di Vena di Sotto (1496m) and Passo di Vena di Sopra (1545m), which is 250m shorter, to join the main road again just before turning left and take the same way to the top. From the west there are many alternative appoaches and some could be combined. 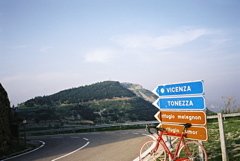 The longest climb is from Rovereto (200m) and Volano (189m), or one could take the normal road from Calliano (190m). One would go via Serrada (1254m) on the first two climbs, and via Folgaria (1165m) or Guardia when climbing from Calliano. On all these climbs one has to pass over Passo Coe/Coepaß (1612m) (the road only descends to 1531m before the final climb to Valbona 6.1 km after Passo Coe). One could also start in Folgaria if coming from Passo del Sommo (1342m), or from Terragnolo (782m) if coming from an alternative southern approach via Passo della Borcola (1219m). You can also continue 2 km to the top of Monte Toraro (1890m), which would be a 1621m (23.4 km) climb from Barcarola via the Passo Vena road, 1844m (35.6 km) total climb from Volano or best a 1798m climb from Calliano (190m) via Guardia! Other comments It is a very nice road from Arsiero to Valbona (rather impressive in places). From Valbona to Folgaria, I found the area a bit dull, but it is nicer on the climbs up to Folgaria and Serrada from the west. This is the highest asphalted pass in the area. There is also a gravel road going eastwards from near the pass that goes flat for 420m to the easily accessible Forcella Molon (1768m) (there is a sign suggesting cycling is forbidden here, but it seems irrelevant if one only goes to the pass and back again). No water near the pass. This is the most southern asphalted +1700m pass climb in this part of the Alps.